How cold is your fridge? Steve James and Chris James review recent surveys on temperatures within domestic refrigerators. This article updates previous articles on the old FRPERC University of Bristol website and our review published in the Journal of Engineering in 2008 (James, S. J., Evans, J. & James, C. (2008) A review of the performance of domestic refrigeration. Journal of Food Engineering. Vol. 87, pp2-10.). The past thirty years has seen a considerable increase in legislation defining maximum temperatures during the production, distribution and retailing of chilled food. However, as soon as the consumer purchases the food, it is outside of any of these legislative requirements. Increasingly food poisoning incidents have been found to be due to mishandling of food in the home with insufficient refrigeration or cooling being the most frequent factor causing disease. Consumer handling of products may not be as intended or envisaged by the manufacturer. For instance, many chilled products are purchased on the basis of the ‘fresh image’, but then frozen at home. After a chilled or frozen product is removed from a retail display cabinet it is outside a refrigerated environment whilst it is carried around the store and then transported home for further storage. In the home it may be left in ambient conditions or stored in the refrigerator/freezer until required. In the early 1990s FRPERC was commissioned by the Ministry of Agriculture Fisheries and Food (MAFF) in the UK (Evans et al., 1991; reported in the following papers: Evans, 1992; James & Evans, 1992a; James & Evans, 1992b). As part of this survey of 252 households, participants were asked questions to assess their attitude to food poisoning, shopping habits and the length of time they stored chilled foods in the home. Monitoring was then carried out to determine the length of time and temperature foods were stored at in the home. These data were augmented with experimental data from laboratory studies on the performance of refrigerators and temperature changes during transportation to the home. Many other studies have been reported from around the world (Table 1) and show that consumer handling of refrigerated foods and the performance of their fridges is similar throughout the world and is relatively unchangeable. Perhaps even more remarkable is that despite numerous recommendations on handling and storage temperatures, consumer use and the performance of refrigerators remain remarkably unchanged throughout the world over the last 30 years! Spreen (1925) states that in 1919 the mechanical domestic refrigerator passed from the pioneering to the production stage in the USA. Records showed that from 1919 to 1924 there was a 100% plus increase in sales each year and orders in 1924 were 350% higher than a year earlier in the USA. The refrigerator is now a common household device and very few households in the developed world do not own a refrigerator or fridge-freezer for the storage of chilled foods, in the UK penetration is >99% (AMA Research, 2003). There have been many developments since a new domestic refrigerator was discussed in 1923 (Anon, 1923). To quote “Experiments conducted by the National Association of Ice Industries over a period of several months have resulted in a domestic refrigerator that is expected to produce better refrigeration in every sense than any of those on the market. It is constructed along lines which make it remarkably efficient and long lasting. Balsa wood is used for the framework and also serves as insulation. Two inches of the wood are used throughout as insulation. The insulation is lined inside and out with five-sixteenths of an inch of artificial stone made from a special waterproof composition with mangasite as a base. The result is a refrigerator which is literally hermetically sealed.” There have been considerable developments in the energy efficiency and the refrigeration systems used in domestic refrigerators (Radermacher & Kim, 1996) however these developments have often been divorced from the temperature within the storage compartment. The temperature at which a refrigerator operates is critical for the safe storage of chilled food. Recommendations in the UK concerning the microbiological safety of foods advise that maximum temperatures in domestic refrigerators should not exceed 5°C (Richmond, 1991). Nearly all the participants in our study when asked what actual temperature their refrigerator operated at were unable to give a value and gave answers based on the method they used to set the temperature dial (Figure 1). A large number of people (32.8%) set their refrigerators according to the weather, setting the refrigerator to a lower temperature (higher setting) in the summer. It was interesting to note that although 38 participants had a thermometer in their refrigerator only 30 actually used the information to set their refrigerator temperature. A recent Irish study found 22% of consumers aware of the correct refrigerator temperature (Kennedy et al., 2005). 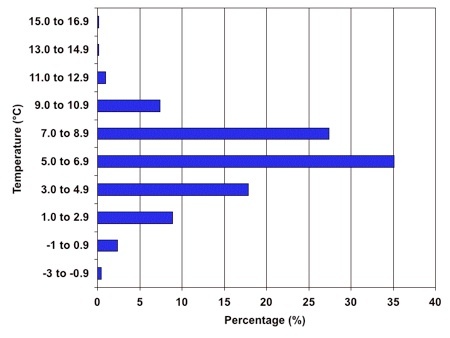 A recent Swedish survey (Marklinder et al., 2004) found a much better level of awareness amongst its survey group, with 85% of respondents knowing the recommended refrigeration temperature (in this case 8°C). However, not all of those consumers put their knowledge into practice, the survey found 40% of food storage temperatures exceeded the maximum recommended temperature for the food being stored. Also only 25% knew, or regularly measured, the temperature of their fridge. 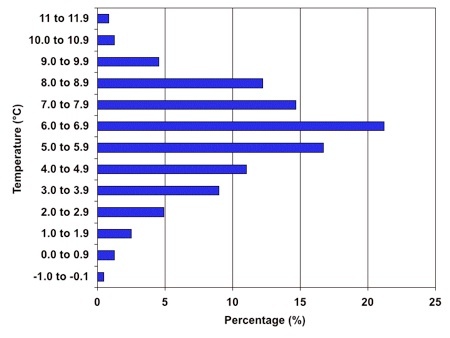 In the Irish study 23.2% had a refrigerator thermometer. An Australian telephone survey (Jay et al., 1999) found only 15.5% of respondents knew the temperature of their fridge. To evaluate temperatures within each refrigerator in our study we used miniature data loggers to measure temperatures throughout the refrigerators. Our results showed that the mean temperature over 7 days (evaluated from top, middle and bottom sensors) ranged from -1°C to 11°C. The overall mean air temperature for all the refrigerators in the survey was 6°C, with 70% of refrigerators operating at average temperatures above 5°C (Figure 2). This figure of 70% appears to be common to many other studies throughout the world (Table 2) and interestingly doesn’t appear to change with time. A recent review of all European studies showed that overall the average air temperature in European fridges would appear to be 6.64°C (Nauta et al., 2003). A detailed survey of food temperatures of products stored in Swedish consumers fridge’s found that 22% of minced meat samples were stored above 8°C and 44% of ham samples (Marklinder et al., 2004). While an increasing number of refrigerators are sold with a single point temperature display, Laguerre et al. (2002) found that ‘the temperature measured using a thermometer does not represent the true operating conditions of the refrigerator’. In fact temperatures in refrigerators are not static. An analysis of percentage time spent between certain temperatures carried out in our study, calculated for all refrigerators, showed that greatest proportion of time (80.3%) was spent between 3 and 8.9°C. Only small amounts of time were spent above 9°C (Figure 3). However, only 4 refrigerators (1.6%) in the whole survey operated below 5°C during all the monitoring period and 33.3% of refrigerators spent all their time above 5°C. A further analysis showed that in 69.9% of refrigerators the warmest place was in the top and in 45.1% the coolest place was in the middle (Table 3). However, the top of the refrigerator was not always the warmest and the bottom the coldest place (Table 4). A Swedish survey found that those consumers that made an effort to store food in the coldest location usually believed that location to be the top shelf (Marklinder et al., 2004). The mean temperature range within a refrigerator was found to vary between refrigerator types. Ice box refrigerators had the smallest range (average 1.8°C); whereas the range in temperature in fridge-freezers and larder refrigerators was nearly twice as great (average of 3.4°C in fridge-freezers and 3.7°C in larder refrigerators) (Table 5). A survey carried out in China found higher ranges in temperature within domestic refrigerators with only 2.3% of the refrigerators surveyed operating with a temperature range of less than 6°C: 34.1% had differences of 8-12°C, 34.1% in the range 12-14°C and 29.5% differences greater than 14°C (Shixiong & Jing, 1990). A couple of recent surveys have published data on the cleanliness of domestic fridges. 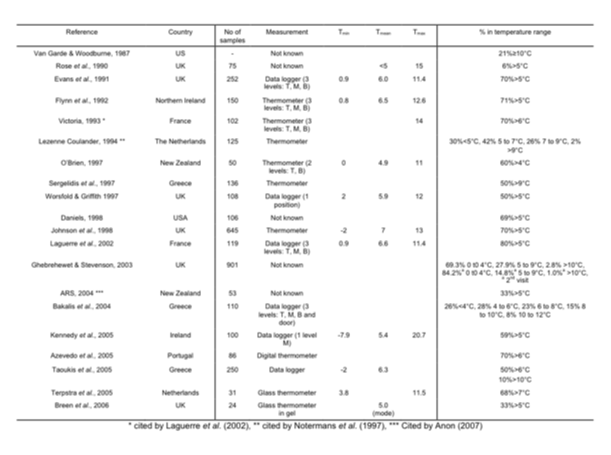 An Irish survey of the hygienic status of domestic refrigerators (Kennedy et al., 2005) found a wide range of undesirable bacteria and pathogens (Table 6). Fifty two percent of refrigerators contained at least one pathogen. A higher general incidence of pathogens and higher APCs were found in urban consumers refrigerators than those of rural consumers, and consumers under 25 were more likely to have one or more pathogens present in their refrigerators. Interestingly the refrigerators of consumers from socioeconomic group ABC1 had significantly higher APCs than those belonging to members of the C2DE group. A survey of consumers in Portugal (Azevedo et al., 2005) found that only 6% of those surveyed cleaned their fridge weekly, while more than 80% cleaned only monthly or less frequently. Of these only 8% were cleaning with appropriate proprietary cleaning products. However, the incidence of listeria in these fridges was low, L. monocytogenes was found in 3 out of 86 refrigerators. Despite all these surveys, how fridge temperatures and cleanliness impacts on consumer health remains to be fully assessed. What is clear is that many refrigerators throughout the world are running at higher than recommended temperatures. So the question is, how cold is your fridge? Azevedo, I., Regalo, M., Mena, C., Almeida, G., Carneiro, L., Teixeira, P., Hogg, T. & Gibbs, P. A. (2005) Incidence of Listeria spp. in domestic refrigerators in Portugal. Food Control. Vol. 16:2, pp121-124. Daniels, R. W. (1998) Home food safety. Food Technology. Vol. 52:2, pp54-56. Evans, J. (1992) Consumer handling of chilled foods - perceptions and practice. International Journal of Refrigeration. Vol. 15:5, pp290-298. Evans, J. A., Stanton, J. I., Russell, S. L. & James, S. J. 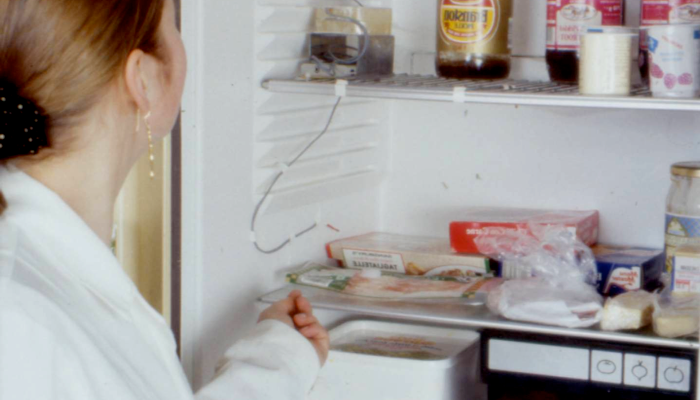 (1991) Consumer handling of chilled foods: A survey of time and temperature conditions. MAFF Publications, London PB 0682. Flynn, O. M. J., Blair, I. & McDowell, D. (1992) The efficiency and consumer operation of domestic refrigerators. International Journal of Refrigeration Vol. 15:5, pp. 307-312. 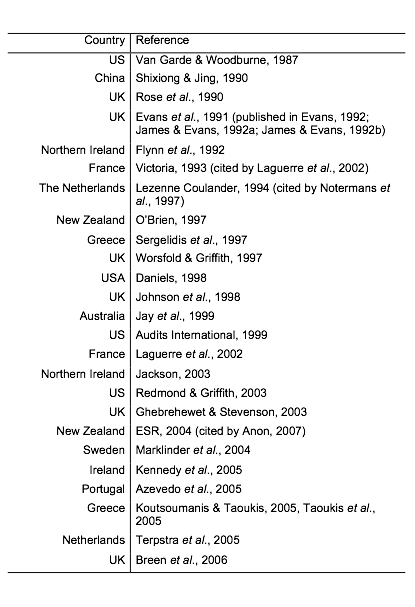 Jackson, V. (2003) Food Safety Knowledge and Practices in Irish Homes. PhD Thesis in preparation. University of Ulster at Jordanstone. James, S. J. & Evans, J. 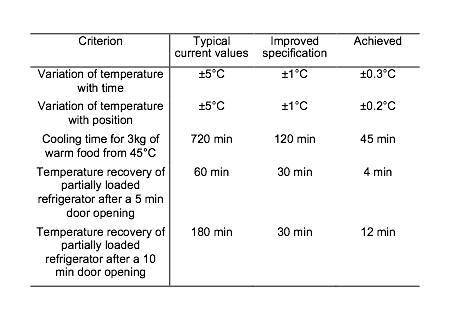 (1992a) Consumer handling of chilled foods - temperature performance. International Journal of Refrigeration. Vol. 15:5, pp299-306. James, S. J. & Evans, J. (1992b) The temperature performance of domestic refrigerators. International Journal of Refrigeration. Vol. 15:5, pp313-319. Jay, L. S., Comar, D. & Govenlock, L. D. (1999b) A national Australian food safety telephone survey. Journal of Food Protection. Vol. 62:8, pp.921-928. Johnson, A. E., Donkin, A. J. M., Morgan, K., Lilley, J. M., Neale, R. J., Page, R. M. & Silburn, R. (1998) Food safety knowledge and practice among elderly people living at home. Journal of Epidemiology and Community Health. Vol. 52, pp745-748. Kennedy, J., Jackson, V., Blair, I. S., McDowell, D. A., Cowan, C. & Bolton, D. J. 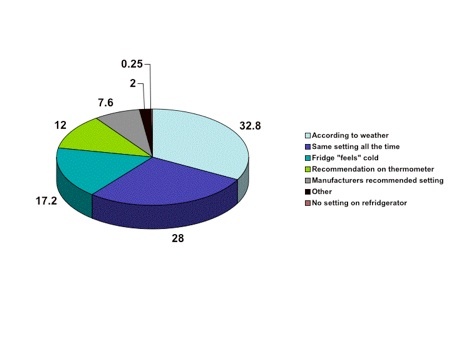 (2005) Food safety knowledge of consumers and the microbiological and temperature status of their refrigerators. Journal of Food Protection. Vol. 68:7, pp1421-1430. Laguerre, O., Derens, E. & Palagos, B. (2002) Study of domestic refrigerator temperature and analysis of factors affecting temperature: a French survey. International Journal of Refrigeration. Vol 25, pp653–659. Marklinder, I. M., Lindblad, M., Eriksson, L. M., Finnson, A. M. & Lindqvist, R. (2004) Home storage temperatures and consumer handling of refrigerated foods in Sweden. Journal of Food Protection. Vol. 67:11, pp2570-2577. Nauta, M. J., Litman, S., Barker, G. C. & Carlin, F. (2003) A retail and consumer phase model for exposure assessment of Bacillus cereus. International Journal of Food Microbiology. Vol. 83, pp205-218. Notermans, S., Dufrenne, J., Teunis, P., Beumer, R., te Giffel, M. & Peeters Weem, P. (1997) A risk assessment study of Bacillus cereus present in pasteurized milk. Food Microbiology. Vol. 14, pp143-151. O’Brien, G. D. (1997) Domestic refrigerator air temperatures and the public’s awareness of refrigerator use. International Journal of Environmental Health Research. Vol 7, pp141–148. Redmond, E. C. & Giffith, C. J. (2003) Consumer food handling in the home: A review of food safety studies. Journal of Food Protection. Vol. 66:1, pp130-161. Richmond, M. (Chairman) (1991) The microbiological safety of food part II. Report of the committee on the microbiological safety of food. HMSO, London. Shixiong, B. & Jing, X. (1990) Testing of home refrigerators and measures to improve their performance. Progress in the Science and Technology of Refrigeration in Food Engineering, Meeting of IIR Commission B2, C2, D1, D2/3, Dresden (Germany). pp. 411-415. Van Garde, S. J. & Woodburne, M. J. (1987) Food discard practices of households. Journal of the American Dietetic Association. Vol. 87, pp. 822-829. Victoria, R. (1993) Ne joves pas avec le froid. 50 millions de consommateur. Vol. 267, pp36–37.